When your hormones are out of balance, it can wreak havoc on your body and overall health. It can make you feel exhausted in one moment and high strung the next, it can increase cravings and prevent weight loss, and you’ll likely notice that your mood is up, down and all around. There are medications you can take to balance hormones, but not everyone wants to go that route. So, the question stands: How can I balance my hormones naturally? Luckily, there are plenty of tips to help you balance your hormones in completely natural ways. Making a few lifestyle changes can help you sleep better, feel better and live a happier life overall. If you’re experiencing signs of hormonal imbalance, don’t ignore them! Get to the root of the problem and balance them naturally! There are a number of common signs of hormonal imbalance that can signal the need for some lifestyle changes. Since hormones play a big role in regulating your metabolism, unexplained weight gain or loss, and stubborn belly fat can be a telltale sign that your hormones are out of whack. If you’re experiencing intense or unusual cravings or irregular digestion, an imbalance may be causing the discomfort. A low libido can also be a sign of hormone imbalance, as can anxiety, insomnia and mood swings. Chronic fatigue, and feeling exhausted on a day to day basis can result from the inability to digest food, weight gain, mood swings and lack of sleep. As you can see, balanced hormones are incredibly important. An imbalance can mess with your body, health and everyday life. Take a look at 7 top tips for balancing hormones naturally and get your body back on track! Poor gut health (or leaky gut) is one of the top things that causes hormonal issues. Leaky gut happens when undigested food particles leak through your gut into your blood stream, causing heightened inflammation and autoimmune reactions. Think: arthritis and thyroid disorders. In order to get a healthy gut, up your probiotic intake! Probiotics are good bacteria that regulate key hormones like insulin, gherlin and leptin. You can find probiotics in foods such as live-cultured yogurt, miso soup, tempeh, kefir, fermented vegetables, pickles and dark chocolate. Healthy fats, like avocado and salmon, are key for hormone production. Not only that, they help boost your metabolism, promote weight loss and reduce inflammation. Healthy fats support the creation of healthy levels of cholesterol, which is important for hormone synthesis. These foods, rich in vitamins and minerals can also contribute to healthier skin that is affected by hormonal imbalance. If you suffer from acne, eczema, dry skin or sun damage, the release of hormones from these healthy fats can help your skin naturally and effectively! Unhealthy sleep habits can seriously throw your hormones out of whack. You need to make sleep a priority, and create a bedtime routine that is relaxing and non-stressful. Take a bath, do meditation, and stay away from screens for at least an hour before you go to sleep. A lack of sleep is one of the top contributors to high cortisol levels, which can result in excessive stress, fatigue, anxiety and weight gain. A proper night’s rest can keep your stress hormones balanced and increase energy so you can function properly during the day. It also helps reduce stress and mood swings, which are common when your hormones are unbalanced. Exercising is so important when it comes to balancing your hormones. Exercise decreases stress, boosts your metabolism, reduces inflammation, and helps you maintain a healthy weight. It also helps you sleep better, which we already know is another key factor in balancing hormones! Exercise can also help if you’re experiencing mood swings, since it releases chemicals and hormones that boost your mood. If you’re noticing extra abdominal fat (which in turn increases the risk of heart disease), regular exercise and a healthy diet is key to controlling the weight and burning calories. Be careful of what you put into your body if you’re experiencing hormonal imbalance. Caffeine can trigger stress conditions for the body, while alcohol can negatively affect your liver functioning, which is crucial for hormonal balance. Caffeine also depletes magnesium and other nutrients key to healthy hormones. They both contribute to sleep issues, which in turn makes you more tired and likely to head for the coffee machine the next morning. And the cycle continues. Eliminating or minimizing your caffeine and alcohol intake can reduce stress levels, rev your energy and help you sleep better. All these things are important for a healthy hormonal balance. Gluten affects most people in a negative way. It doesn’t just affect those with celiac disease, gluten sensitivity has been linked to estrogen imbalances and menstrual disorders. Women with gluten sensitivity who are reaching peri-menopause need to be especially cautious as the over-consumption of gluten can lead to increased body fat, fatigue and mood swings. If you’re noticing any of these sensitivities, gluten should be cut out completely or minimized! Just like a lack of sleep, if you’re really stressed, your cortisol levels can skyrocket, leading to serious health issues. You need to reduce stress in order to get your hormones back in check. There are plenty of ways to decrease stress, from taking a yoga class, to meditating, to exercising and hanging out with people that make you laugh and take your mind off your anxieties. Do you feel like your hormones are out of whack? Try these 7 tips to get them back on track and live a healthier, happier lifestyle! 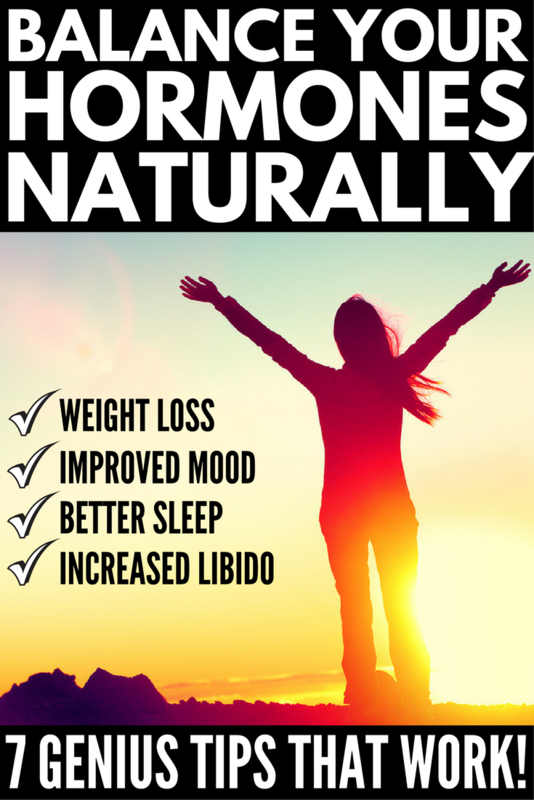 If you loved how we answered the question: How can I balance my hormones naturally?, please share it on Pinterest! And if you’re looking for more health tips and tricks, please follow our Health board on Pinterest!